Daniel 5 is a fascinating chapter. Belshazzar, the titular king of Babylon and grandson to the great Babylonian king, Nebuchadnezzar, was one of those who never learned from history. His grandfather’s pride led to his being punished with the disease of boanthropy – believing and acting like a cow – until he repented and came to his senses and was restored to his grandeur. Belshazzar surely would have heard the story. Had he learned? No. He was filled with pride. Daniel 5 says as much, but it is evident in what was happening in the capital even as the enemy was at the gate. Nabonidus, Belshazzar’s father and the actual king, was gone waging war against the Medes and Persians, and Belshazzar was left in the citadel of Babylon to rule in his absence. The Medes and Persians were outside the walls, threatening the city. So what does Belshazzar do? He hosts a wild party. What was Belshazzar thinking? We can only surmise, but he had invited all the nobles to a great feast that night. It seems as if Belshazzar was mocking the enemy, or trying to convince his nobles (and perhaps himself!) that they had nothing to fear for he was, after all, the king of Babylon! If there is a sin that has plagued creation since the time of the beginning, it would seem to be pride: pride in thinking we know better than the Creator what is good and best for us, pride that causes us to think we created our own successes and are alone responsible for our achievements. It is pride that makes us seek more and more possessions, more and more power, more and more fame and glory for ourselves. And Belshazzar had it in spades, this sin called pride. Pride blinded Belshazzar to what befell his grandfather. Sin blinded him to the realities of the situation with which he was confronted. And that is what sin does best: it makes us unaware of the danger involved. Especially when sin is coupled with God’s long-suffering nature. Because we have all sinned and seem to have “gotten away with it” (which is really just God’s incredible patience to have not stricken us dead on the spot, for “the soul that sins shall surely die”), we are blinded to the danger of our sin. It is like playing with a king cobra and not being bit. It leads us to a false sense of well-being and we conclude that “all must be well” when in reality, as Belshazzar found out, it was not well at all. That very night, in Daniel 5, Belshazzar was overthrown and killed. We have recently seen how this happens with the entire Ashley Madison hack. Those who thought they were “safe” in their secret sins one night, awoke the next morning to find they had been deceived into thinking they were safe and their infidelities were secret and hidden. Sin’s deception is hideous. It makes us unaware of the danger. And that is perhaps the greatest danger of all. PRAYER: Keep us from deception and from convincing ourselves that all is well when we sin! Reveal to us the danger in the things we do – yet seem to get away with. Make us wise to Truth! In Jesus’ name, Amen. It hasn’t been that long – you may remember it. A few years back a tremendous human drama played out above and below ground in the Quecreek mine in Pennsylvania. A group of miners were drilling in a coal mine shaft. Unbeknownst to them, their map was wrong. They believed that they were hundreds of feet away from an old mine shaft that had long ago been flooded. As their drill bit broke through into the flooded shaft, millions of gallons of water began pouring into the mine where they were working. The water filled the lower section of the shaft and cut off their escape route to the surface. They were trapped in a cold, totally dark mine shaft. I probably would have totally freaked out – I am claustrophobic, and one of my worst nightmares is to be trapped somewhere. But these men decided early on that they would live or die as a group. They wouldn’t split up, taking their chances as individuals. Whatever their fate held, they would face it together. And so days passed while rescue teams drilled a new hole through which the men might be rescued. As they huddled together in the cold, dark wetness of the shaft, when one member became too cold, they would all huddle around that man and hold them until they warmed up, and then they’d take turns warming others. 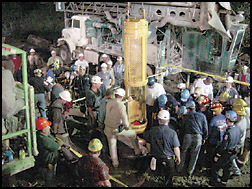 Eventually, the rescuers managed to reach the men and they were all rescued from several hundred feet underground. The rescue was shown on television. It took place at night, as I recall, when the first miners were brought up to the surface, soaked, dirty, but very, very happy to be alive. I was very moved by the images of the men coming up out of that dark pit. As Christians there are powerful lessons in what happened to these men. FIRST: it’s important to have the right map. If they’d not had an incorrect map, they wouldn’t have ever drilled the hole that let the water in. We can easily look for direction in the wrong places. Guidance must come from a reliable source. If you want truth, you must turn to the Truth. SECOND: there was power in the men staying together. It’s easy to think that we can go it alone and survive. And in fact, rather than binding together as people who are going through an ordeal (make no doubt about it, we are living in a very serious and deadly situation), we often turn on one another and are more interested in scoring points rather than survival and helping one another live. THIRD: waiting must be extremely hard to do when you are in a flooded tunnel with a diminishing air supply in total darkness. Yet these men realized that their best chance for survival was to stick together and wait for rescue to come. They could have untied themselves and tried in vain to swim through the pitch-black tunnels in search of the exit – and they would have drowned, almost certainly. As Christians, we need to tie and bind ourselves together with the love of the Lord, helping one another survive until the Rescuer from above appears. Scripture is full of admonitions to persevere, to wait upon the Lord and His time and will. Romans 8:23-25 – Not only so, but we ourselves, who have the firstfruits of the Spirit, groan inwardly as we wait eagerly for our adoption as sons, the redemption of our bodies. 24 For in this hope we were saved. But hope that is seen is no hope at all. Who hopes for what he already has? 25 But if we hope for what we do not yet have, we wait for it patiently. PRAYER: God, help us love one another truly from the heart and be united in love and by the family ties that bind us! In Jesus’ name, Amen. It won’t be long now until The Lion, the Witch and the Wardrobe finds its way to the big screen. I don’t know if you’ve seen previews of it, but it looks great. It is, of course, based on the book of the same name which is part of C.S. Lewis’ Chronicles of Narnia. How fitting (and delightful) that it should come to the big screen. Of course, I’ve not see it so I can’t vouch for the content, but what I’ve seen by way of previews looks very exciting, indeed. Already there are Christian books springing up in anticipation of capitalizing on the movie and the books that Lewis wrote. I even bought one. I remember trying to walk on water as a child, and failing. Was I disappointed? Yes, I was. In many things since my childhood, I’ve tried to take a step in faith. Sometimes it was successful (although it isn’t really about me and my success as much as it is my willingness to say, “Yes, Lord!” when he asks me to take a step), many times I failed. When I failed, it was usually because whatever I was trying to do didn’t make sense to me, or rather, I concluded that it would never work and didn’t take that step of faith because I was afraid that I’d sink, just like I did when I tried walking on water as a little kid. “It didn’t work then, it won’t work now,” might as well have been my mantra. And sadly, there are still times in my life now when I don’t try to walk on the water anymore. And that is a tragedy, because life lived with Jesus calls for walking on water, for the power to imagine what could be, for the excitement and amazement of the adventure that beckons us onward. If Jesus walks on water, and I am to follow him, doesn’t it stand to reason that I must walk on water at least part of the time, too? Of course, I’ll only be able to walk on the water if I’m walking with him and through his uplifting power and Presence. Imagine. Imagine what God could do through you. If you need to pretend in your head first, fine…go right ahead. But don’t let it stop there. After the Spirit puts the vision in your heart and confirms it, live it!!!! PRAYER: Lord, we long for a great adventure, but are afraid to take the first step because we’ve failed so often. Help us to take the first step when Your Spirit shows us the direction! In Jesus’ name, Amen. DayBreaks for 8/25/15: Fix Me! How do you like the feeling of being broken? It’s not much fun, is it? I’ve never had any broken bones except my nose, so I can’t relate to a broken bone too much, but I can relate to feeling broken inside. I’ve felt it several times: at the death of my father, the times our children have moved out of the home to start their own lives, the times when my wife and I have been at bitter odds with one another, when a beloved dog died. There are many things in life that make us feel broken. But it is interesting to contemplate that we may spend so much time grieving over our sins (we should grieve over them for they are very serious), that we forget to do the things that are GOOD, the good works for which God created us. You’ve probably known people as I have, who are so wrapped up in their guilt and shame that they can’t get out of their own self-constructed dog-house. Not even after surrendering their lives to Christ! As Mr. Colquhoun says later on, there is only one cure for that – and it’s the blood for Jesus. That’s the only thing that can take away our guilt and shame. Once we’ve claimed His blood, we need to claim the promise of wholeness and forgiveness that comes along with it. To do anything less than accept his forgiveness to cover and remove our guilt and shame is nothing less than a lack of faith in his promises! PRAYER: Lord, I don’t want to be content to just not to bad…I want to do good for Your glory and the benefit of Your creation! In Jesus’ name, Amen. I have some very dear friends who are very interested in “activism.” What do I mean by that? I mean that they’re engaging our culture in as many different ways as possible to try to bring more of the Light to bear on the world’s darkness. They engage in debates, letter-writing campaigns, lobbying efforts, make phone calls to talk radio hosts and some even have run or consider running for public office. Don’t get me wrong, my hat is off to them. I think that what they’re doing is good – they’re at least trying to be the salt and light that we are all called to be. Some folks are called to be more activist than others. Some are more given to acts of service (like Mother Theresa) than political wrangling. God needs people of all kinds, shapes and sizes to do what He wants done. Still, there’s a part of me that thinks we need to be cautious in our activism. The things we usually become activists about are the things that anger and frustrate us. And anger is not a very good motivation when it comes to doing the Lord’s work. At least not if the anger is something other than righteous indignation. If our anger is directed towards the person and not their actions, we may be missing the boat and working out of ungodly motivations. Wouldn’t it be true that if our activism, no matter how well-intentioned it is, drives the possibility of love out of the heart of those towards whom my activism is directed, then I am not a proper representative of the gospel of Christ? If my attitudes produce frustration that blocks their way to the cross, I must not be spreading grace, but rather demanding adherence to law. 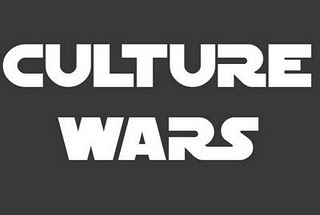 It is true that a culture war is inevitable and must be fought. I am convinced that such is, indeed, the case. We can’t just let it go by without even raising Godly concerns and truth to the forefront. But we shouldn’t use the same weapons that the enemy uses. We should use the weapons of the Spirit, being armed with grace at all times. When you stop to think about it, when we were born into the family of God, our birthmark changed from anything that characterizes the world to become something that characterizes the kingdom of God. We should have but one birthmark: not political correctness, legal or moral superiority, but love. No matter how much we might achieve without love, Paul reminds us that it is of no value. 1 Cor. 13:1-3: If I speak in the tongues of men and of angels, but have not love, I am only a resounding gong or a clanging cymbal. 2 If I have the gift of prophecy and can fathom all mysteries and all knowledge, and if I have a faith that can move mountains, but have not love, I am nothing. 3 If I give all I possess to the poor and surrender my body to the flames, but have not love, I gain nothing. The next time we’re tempted to react hotly to something in our culture, let’s be sure our birthmark shows. PRAYER: Let us never betray our Father! Lord, help us clearly demonstrate Who our Father is! In Jesus’ name, Amen. LONDON – It’s nice to wake up from surgery to see your family gathered around you for support. For Melvyn Reed, however, it wasn’t so nice when he awoke from triple bypass surgery to find all three of his wives surrounding him. While he was under the knife, his years as a double bigamist came to an end when the three women showed up at the same time to the hospital and realized something wasn’t right. They held a meeting in the parking lot and discovered they were all married to the same man! Reed later turned himself into police, admitting he was married to all three women, and confessed to bigamy. I remember waking up after my bypass surgery and having the nurses and my wife present. It was a wonderful and comforting feeling to have her there, and to know that, well, I was still among the living and that the nurses were being so attentive. I can’t imagine what kind of thoughts must have gone through Mr. Reed’s mind, however, when he opened his eyes to see all 3 of his wives standing beside his bed. He may have been afraid to go back to sleep for fear that they’d unhook his medical equipment! I’ve written many times about the passage that describes the human heart as being totally deceitful. Of all the things that can deceive us in this world, our own hearts and minds must be on the top of the heap. And there is nothing that we deceive ourselves about more completely than in thinking that our sins are hidden. Why? We take comfort in thinking that they’re hidden, and we probably take a bit of perverse pride in our ability to cover them up, too. We can hide much from the eyes of our families, friends, co-workers and fellow students, even from our pastors and spiritual mentors. The Spirit, however, sees all. May we learn from the foolishness of Melvyn Reed that we’re not nearly as clever as we think we are. All that is hidden will be made known. Luke 12:2-3 – There is nothing concealed that will not be disclosed, or hidden that will not be made known. 3 What you have said in the dark will be heard in the daylight, and what you have whispered in the ear in the inner rooms will be proclaimed from the roofs. 1 Cor. 3:13 – But there is going to come a time of testing at the judgment day to see what kind of work each builder has done. Everyone’s work will be put through the fire to see whether or not it keeps its value. PRAYER: Let us truly understand that nothing is hidden from You, and that we are foolish to think we can “get away” with our sin! In Jesus’ name, Amen.